Pay per click (PPC) or paid advertisement is a great way to quickly start generating traffic and solid sales to your website. When a user searches in “Google,” “Yahoo!,” “Bing,” Social Media network or their affiliate websites, you can bid for a search term and have an ad displayed in the results. These ads are displayed on the top and side of search results. 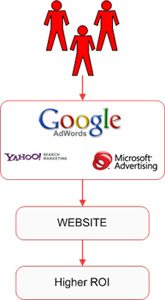 In search engines, PPC (also known as Sponsored Ads) are displayed on the top and the right side of the search results. While in Social Media network such as Facebook, your ads will be shown only on the right side of the account page. Unlike SEO where traffic can take some time to build, traffic with PPC campaigns can be generated in matter of minutes! Your ads can be displayed 24/7 or any time of day when you’d like your ads to be up and running.